"During a trip to Kenya in 1993, I had the opportunity to visit a small village school. As I was walking through, I noticed that no girls were present. I had to ask the headmaster, "Where are the girls?" To which she responded, "They are not required to attend." That moment changed my vision. 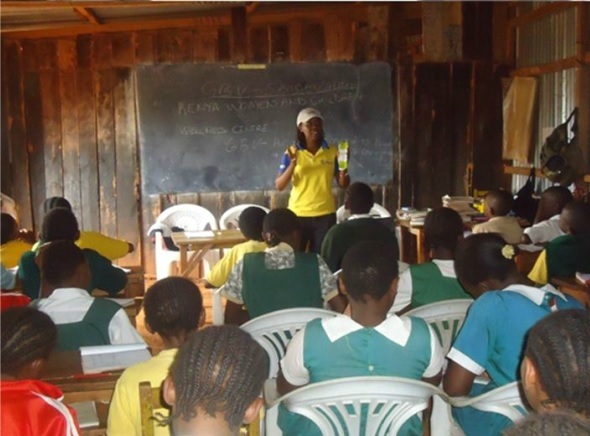 It became my passion to help girls in Kenya find the stability and opportunities to grow. And that has led me to today, twenty years later, more passionate than ever about helping girls in Kenya find a voice through education and health care initiatives." Education has been defined as the process through which knowledge, skills, attitudes and values are imparted for the purpose of integrating the individual in a given society, or changing the values and norms of a society. In Kenya, before the coming of Europeans, there were no classrooms and no special class of teachers. All members of the community were involved in the education of children. Now, primary school is a free system and has become the initial phase of the education system, serving students between the ages of 6-14 years. The main purpose of primary education is to prepare students to participate in the social, political and economic well being of the country, and prepare them to be global citizens (Education Info Center, 2006). While primary school in Kenya is free, it is not compulsory, and as in most developing countries, girls do not receive the same educational opportunities as boys. Even when given the opportunity to be educated, the girls typically face barriers to the completion of their studies, and approximately 65% of them drop out before completion. low value placed on the education of girls by their parents and society in general. Girls' participation in primary school has become a real concern in all nations of the world, particularly in the developing countries of Sub-Saharan Africa. The education of girls worldwide provides benefits to the family and the society at large, and factors affecting it should be addressed for the sake of human and societal development. Young people from disadvantaged backgrounds are least likely to have skills for decent work, and this lack of skills will affect the lives of these young people forever. Join us today as we reduce the reproductive health barriers to primary school for girls, and provide girls the platform they need to create ripple effects throughout society!